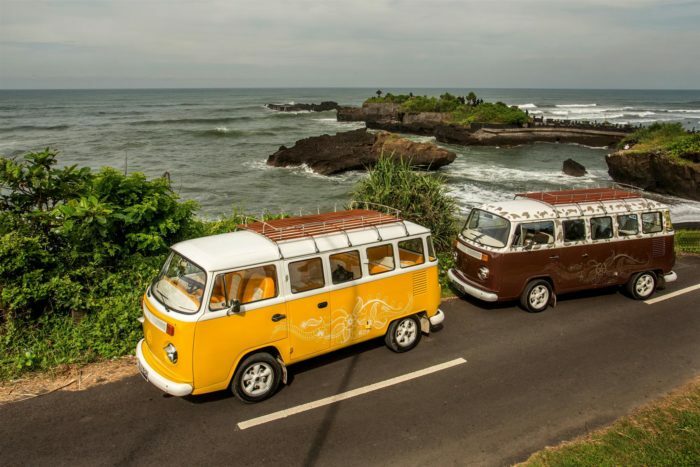 Home READ Alila Seminyak, Bali- INTRODUCING VW KOMBI CARAOKE! Get ready to sing your heart out in our Volkswagen Kombi with your friends and family! If you love strolling around Bali and enjoy singing karaoke, your dream combination has just become a reality. The world’s first karaoke in a car has been born, or to be exact, a new karaoke feature has been added to Alila Seminyak’s Volkswagen Kombi, transforming this uniquely popular transportation into a mobile entertainment complex! This VW Kombi has been in existence for the last two years now at Alila Seminyak, grabbing attention wherever it roams. Indonesia, of course, is one of the homes of karaoke, where people adore singing the lyrics of a song along to recorded instrumental music. As the wheel goes round, guests will be able to sing their favorite songs in the car for only IDR 785.000++ per hour. Up to four people will be able to indulge in this luxury at one time, belting out lyrics from a choice of more than 3,000 hits, from “Dancing Queen” by ABBA to “Done for Me” by Charlie Puth, which they can choose and add to their favorites. Available when twilight hits the island from 6.30 pm until midnight, this fun van is also fully stocked (and can be pre-ordered) with food and beverages plus some catchy attributes to wear during your ‘show’. An alternative way to have fun before your night hopping in the hip Seminyak. If you seek a kind of crazy fun with your friends or family, fun that enables you and your squad to release the inner rock star or diva in you, then this is an experience not to be missed. It’s the perfect complement to the ambiance of Seminyak, Bali’s hippest lifestyle destination. A great new way to go wild with your friends in Bali. The most interesting part? Your whole VW Kombi CarAoke experience will be recorded – for you to keep as a souvenir or even publish on YouTube, waiting for a superstar scouter to spot you!